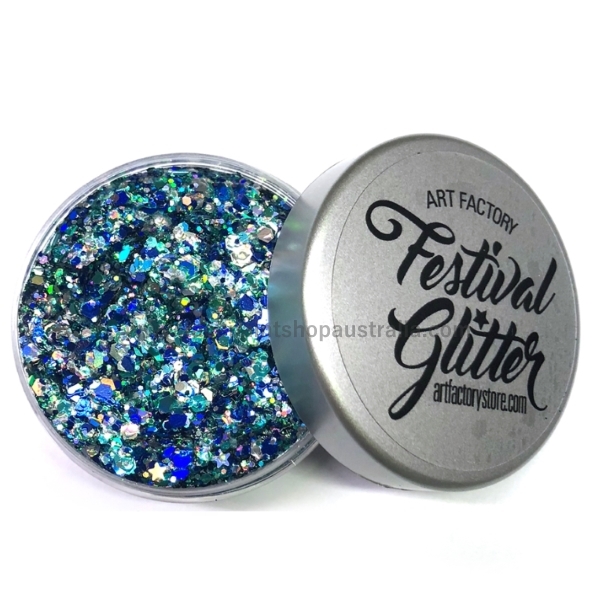 Click the button below to add the Blue 'Frost' Festival Glitter by the Art Factory to your wish list. The latest trend in body art is Festival Glitter, a new line of cosmetic glitter gel made in the USA by the Art Factory. This product contains all cosmetic grade glitters that are safe for the skin and can be used on the face, body, and hair. This product combines a mix of colours and glittering shapes to add sparkle to any face or body art design. It may also be used on it's own, or with other complimentary glitter gel colours as a highlight or complete show-stopper! The holographic reflective glitters create a stunning rainbow effect in the sun. Festival Glitter can be applied with a brush or silicone spatula. A variety of sparkly colours and shapes are pre-mixed with a clear gel so you can paint it on in seconds. No fuss! Dries in approx 5 minutes, and stays on for hours! TIP: keep at room temperature: high or low temperatures may cause change in consistency of the gel.